The most widely liquid fuels all over the world are ethanol and bio-diesel. Ethanol is currently produced from sugarcane or Starch crops ,whilst bio-diesel is produced from animal fats ,vegetables or oil. Bio-Fuels have the ability to be used as blends with conventional fuels in the different vehicles ,As Ethanol is blended with gasoline and bio-diesel is blended with conventional diesel fuels. Ethanol currently presents 86 % of total Bio-Fuels production, One quarter of world ethanol production goes into alcoholic beverages ,It’s also used for industrial purposes and the rest of the world ethanol production becomes fuel which is used in motor vehicles, Whilst most of the world’s bio-diesel is used for transportation fuel and for heating at homes. In 2006 Bio-Fuels represented 0,9% of the world’s liquid full supply by volume, and about 0,6% by transport distance traveled ,yet the increase in supply of the fuel production between 2005 – 2006 the sugar in production accounted for 17% in volume and 13% by transport distance traveled. The First use of the Bio-Fuels in automobiles dates back to early days since when the motorized automobiles appeared. In 1820s Samuel Morey the American inventor used turpentine and ethanol in his very first internal combustion engine ,Then later on Nicholas Otto used ethanol to run his very first spark-ignition engine. Rudolph Diesel used peanut oil in his compression-ignition engine. Henry Ford’s Model T can be used to run on a rang ethanol-gasoline blends ,As the automobiles become so popular in 1900s the fuel market was flooded with inexpensive petroleum fuels. Bio-Fuels was only representing a small proportion of the total fuels ,that dates back to the early 20th century ,As there were Too many European countries with different policies were supported Bio-Fuels especially in Germany and France. 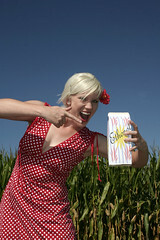 Bio-Fuels were often the favored fuel during World War I and World War II Also ethanol was used to supplement petroleum in USA ,Europe and Brazil. Military demobilization in the post-war period and the development of new oil fields in 1940s are actually two factors helped to bring a glut of cheap oil That eliminated Bio-Fuels from the wold fuel market. 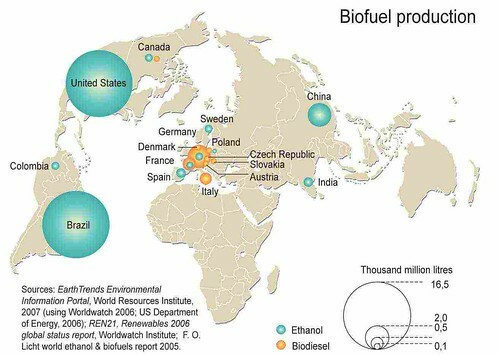 In 2006 USA and Brazil dominate world ethanol production which reached a record 38.2 billion liters, Approximately half of the world ethanol was produced in USA only all of it from corn crops grown in the northern Midwest representing 2 to 3 per cent of the country’s non diesel-fuel. In 2006 ,more than two fifths of the global fuel ethanol supply was produced in Brazil ,sugarcane grown in the center of the south region providing 40 per cent of the county’s non diesel fuel. The remainder of ethanol production comes firstly from EU ,As Germany ,France ,Spain and Sweden were the biggest producers. This Ethanol production is produced by using cereals and sugar beets, Whilst China uses corn ,wheat and sugarcane and India uses sugarcane and cassava. In 2005 many new facilitates of ethanol production programs were under construction ,For Example USA Ethanol production capacity were increased by 3 billion liters ,In addition to 5.7 billions liters of new capacity under construction going into 2006. Bio-Diesel had a similar growth in Europe ,it represented more than three quarters of the Europe’s total Bio-Fuels production ,By 2006 Europe accounted for 73% of all bio-diesel production world wide and German only accounted for 40% of this production and USA ,France and Italy accounted for the rest of this production. Bio-Fuels for Transport: Global Potential and Implications for Sustainable Energy and Agriculture (Hardcover)By (author): Worldwatch Institute.